The TC series of illuminated vandal resistant capacitive pushbuttons from Dailywell are capacitive switches with momentary or latching action. The TC series are available for cutouts of 16mm, 19mm or 22mm with illuminated ring or power logo in red or RGB. 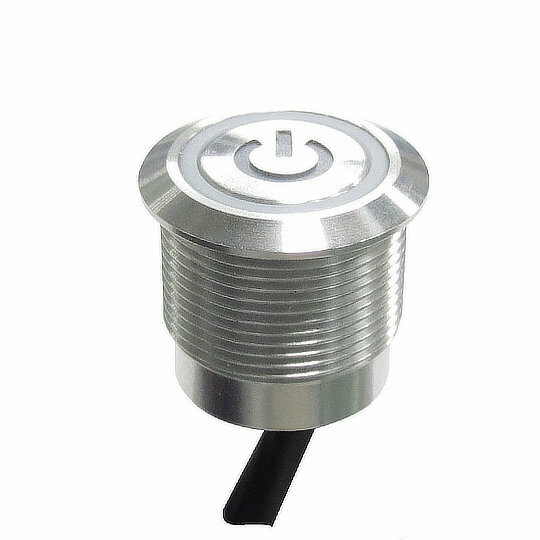 The TC series of illuminated vandal resistant capacitive pushbuttons from Dailywell are capacitive switches with momentary or latching action. The TC series are available for cutouts of 16mm, 19mm or 22mm with illuminated ring or power logo in red or RGB. Electrically rated to 1A at 5-24VDC with a mechanical life of up to 50 million cycles and a choice of 150mm or 300mm 26AWG trailing leads. The TC series is perfect for applications such as Off-Highway Vehicles, Automotive Systems, Strict Access Control Systems, Parking Equipment, Marine, Horticultural Equipment and Medical Devices.